With companies and societies worldwide scrambling to find the next big (affordable) energy source, there is one option that is gaining attention for its ubiquity and constancy: ocean power. While many designs for ocean-power extraction could be considered eccentric, it is important to remember that, as the Anchorage Daily News states, "Machine design for ocean kinetic power is at the stage that flight was in the 1920s, and the devices are spectacular in a Rube Goldberg kind of way, at least to the eye of a non-engineer." This includes designs shaped like flapping hinges, bobbing buoys attached to turbines, giant eggbeaters (helical turbines), or even the now-common windmill-type turbine design...except instead of on windswept plains, they'll be placed deep underwater, generating power from spinning in the path of strong currents. The technology will first be tested in remote locations, who frequently have high electricity bills. Power stations involving ocean-driven energy technology are already in use in Ireland and Scotland, and are currently being installed in Maine and Alaska. 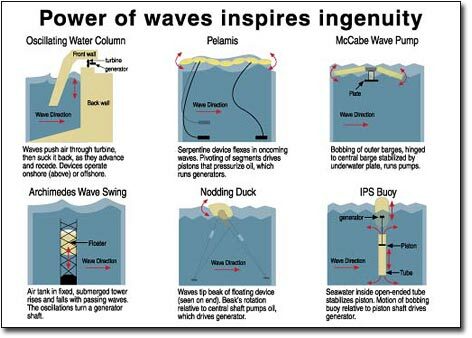 Various types of ocean power-harnessing technology. Image courtesy www.permaculturenews.org. View lots of great articles at http://besttrackingapps.com/snapchat-spy/ for lots of related articles and tutorials on using such a software.